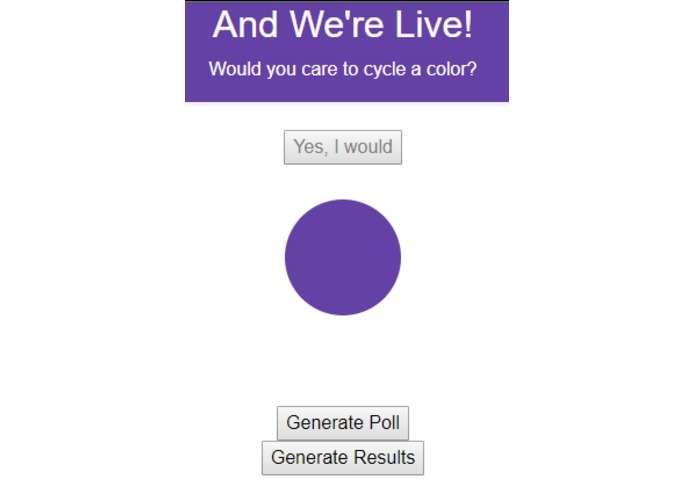 Have you ever felt like making a poll for your viewers, but not one that is too nice or completely functional at all? Well, we have got the extension for you. This extension lets you host a poll that will underwhelm your expectations 9 out of 10 times. Your viewers will be amazed by how ghetto it is. They may or may not be able to vote in the poll, and this extension will definitely spark conversation about its quality. This project was a great challenge for all of us as documentation and guides were very limited on developing Twitch extensions. Many things we had to learn on the fly, and we had to go through great lengths to get the Twitch Rig working on our machines. I am proud that we managed to learn so much about Twitch extensions and creating apps for streamers with thousands upon thousands of subscribers. In the end, we managed to produce something we can show off as a result of our hard work. We learned so much about production level code, and how to make an extension that both the streamer and their viewers will enjoy or not enjoy using. We will continue to make updates that will amaze and astound with our ghettoness. We guarantee it.